Gunnera tinctoria, known as giant rhubarb or Chilean rhubarb, is a flowering plant species native to southern Chile and neighbouring zones in Argentina. It is unrelated to rhubarb, as the two plants belong into different orders, but looks similar from a distance and has similar culinary uses. It is a large-leaved perennial plant that grows to more than two metres tall. It has been introduced to many parts of the world as an ornamental plant and in some countries (for instance New Zealand, Great Britain and Ireland) it has spread from gardens and is becoming a weed problem. It is known under the synonyms: Gunnera chilensis Lam. and Gunnera scabra Ruiz & Pav. Gunnera tinctoria is a giant, clump-forming herbaceous perennial. The leaves can grow up to 2.5m across, cordate and palmate with up to 9-lobed margins. It has erect spikes of cone-shaped inflorescences (to 1m) from spring to early summer, with small flowers. The fruit is orange. The number of seeds is estimated from 80,000 per seedhead to 250,000 per plant. Not closely related to the garden rhubarb - which it resembles. In parts of New Zealand the Chilean rhubarb has become a recognised pest plant. For instance in Taranaki, on the west coast of the North Island it was spread to riverbeds, coastal cliffs and forest margins. G. tinctoria is on the National Pest Plant Accord. Under Section 52 and 53 of the Biosecurity Act, it is an offence to knowingly propagate, distribute, spread, sell, offer for sale. In Great Britain it has become well-established and sometimes problematic in western districts and appears to be spreading. In the west of Ireland, G. tinctoria is a major invasive species, in particular on Achill Island and on Corraun Peninsula, County Mayo. Its large leaves create dense shade, preventing other species from germinating or growing. Chilean rhubarb on sale at a street in Puerto Varas. A similar species is Gunnera manicata (Brazilian giant rhubarb). This species may also be invasive. The blue-green alga Nostoc is a symbiont in Gunnera. ^ Anon. "Giant Rhubarb, Gunnera tinctoria". NNSS species information. GB Non-native species secretariat. Retrieved 1 May 2017. Department of Conservation - leaflet: "Chilean Rhubarb; shading out our natives", Wanganui. March 2006. 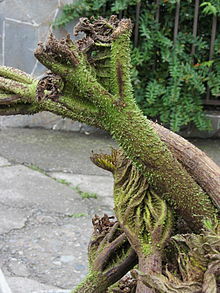 Wikimedia Commons has media related to Gunnera tinctoria.